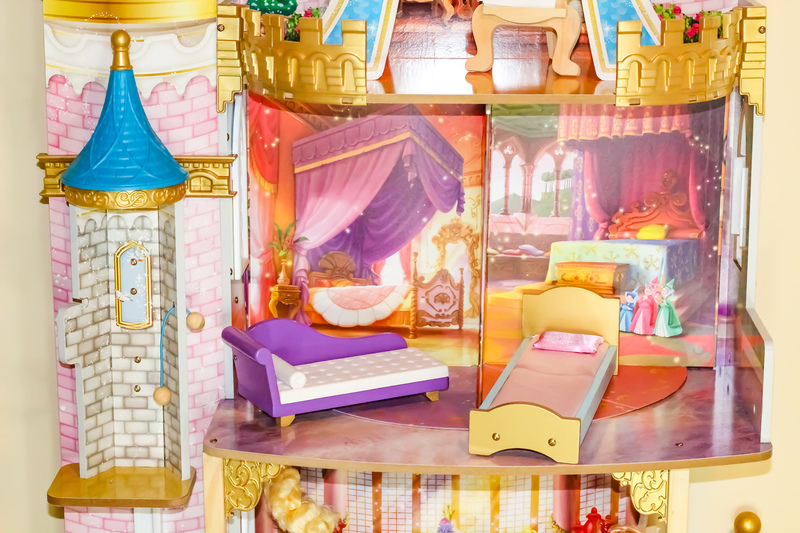 KidKraft Made the Most Epic Disney Princess Doll House! Disclosure: I received this item complimentary, but all thoughts and opinions are my own. If you are looking for the MOST epic dollhouse for your little one for Christmas, the KidKraft Disney Princess dollhouses are the absolute best! They make dollhouses inspired by The Little Mermaid, Frozen, Cinderella, and Beauty and the Beast, and also one that encompasses many of the Disney Princesses: The KidKraft Disney Princess Royal Celebration Dollhouse! This epic FOUR STORY dollhouse is complete with a staircase, elevator for your dolls, and even have multiple backgrounds that incorporate different Disney Princess scenes. Downstairs, there’s a kitchen and bathroom, which comes with a bathtub and stove. On the next floor, is the “Be Our Guest” scene which comes with a dining set and chairs. On the next floor are two bedrooms (or you can remove the background to make one large bedroom) along with a beautiful cushy chase lounge and bed. On the top attic, is a scene inspired by Tangled, with beautiful canopies, and an art easel. Throughout the dollhouse there are “outdoor” balconies. My daughter has had the best time using all her Disney Princess dolls in one dollhouse, pretending they all live in a magnificent castle together! It has been the perfect toy to spark her imagination. Aside from great playtime, this beautifully crafted wooden dollhouse makes for beautiful decor in a child’s bedroom. Along with my daughter’s Disney Princess sheets and pink rug, this dollhouse makes her room look extra enchanting! You can find the KidKraft Disney Princess Royal Celebration dollhouse on KidKraft’s website here.